ARE YOU LOOKING FOR AN INSPIRING FINANCIAL EMPOWERMENT SPEAKER FOR YOUR UPCOMING CONFERENCE, SEMINAR, RETREAT OR ONLINE EVENT? HIRE YOLANDA TO SPEAK AT YOUR NEXT SEMINAR, CONFERENCE, RETREAT OR VIRTUAL EVENT! Would you like to hire Yolanda to speak at your next seminar, conference, retreat or online event? Yolanda’s workshops and keynotes are empowering, interactive and informative, packed full of action steps that participants can begin taking immediately. The topics below can be delivered as a keynote, conference breakout session, corporate/nonprofit training or webinar. Additional topics can be customized at your request. Are you trying to move into that new apartment/dream home but were denied due to your credit score? These days, a good credit score is required to be approved for an apartment or a mortgage. Credit scores have become absolutely vital to achieving financial mobility and success. A good credit score (or above) is necessary for access to certain jobs, housing, and financial opportunities. Credit scores are also the bane of existence for many people who have experienced financial setbacks or challenges at some point. If a low credit score is holding you back from your dreams, it’s time to do something about it. In her work as a certified Financial Counselor, Yolanda has helped hundreds of people learn how to improve their credit scores. By practicing the tips taught in this workshop, many increased their credit scores by up to as much as 35 points in just a few months’ time. Participants will receive powerful actionable steps during this workshop that they can begin practicing right away. Are you STILL struggling to make ends meet? Trying to find the money to pay your bills or to save up for your dreams? Many people feel overwhelmed and confused by their finances. Our relationship with money is lifelong. But the struggle doesn’t have to be. While it does take work and commitment to master your money, it is a lot simpler to do than you think. By practicing 5 steps, you can regain control of your money in just 30 days. You can finally get your money “right” and learn strategies to become debt free, build up your emergency savings fund, or achieve whatever your dream may be. This session will teach you 5 steps to get focused, organized, and consistent in managing your money so that you can achieve your financial goals with new clarity. During this workshop, participants will receive specific action steps empowering them to immediately begin mastering their money. I worked with a group from a NYC middle school for the day, teaching them the basics of personal finance in this interactive computerized environment. I’m in the video at the 1:36 point and shown below in the picture. The camera quickly scanned our group discussing the topics on the boards behind us: how to manage phone and cable bills. It was an enriching experience for both the students and I! I'm here with my student group discussing how we would manage two bills that are vitally important and essential to everyone's budget. Yolanda Ransom is a Financial Educator, speaker and trainer who teaches individuals and under-served groups how to confidently master their money so they can achieve all of their financial dreams. As the CEO & Founder of Yolanda Ransom Consulting, Yolanda firmly believes that we ALL should have access to a life of financial freedom - no matter WHERE we come from. Coming from a lower income background, she is a native New Yorker who grew up in the projects. Working since the age of 12 (at her first summer job), Yolanda’s pivotal moment on her personal finance journey came when she racked up credit card debt. After many years of working, her earnings had increased, but her financial literacy had not. With zero savings and living paycheck-to-paycheck, she began relying more and more on credit, running up thousands in debt. To manage her mounting bills, she took out an exorbitant payday loan, struggling even more to pay her bills. Distressed and frustrated, it was then that Yolanda realized how little she really knew about managing money and resolved to change this. After seeking out financial resources and creating a plan, Yolanda fully paid off all her credit cards and began saving. Today, she continues to be free of credit card debt and practices the successful money habits she learned during that period. Her newfound financial knowledge led Yolanda to move into the financial services industry. Yolanda has over 20 years of experience in the industry at companies such as Xerox, H&R Block, Chase Mellon Shareholder Services, Talent Partners, and others, where she has advised thousands of clients regarding personal finance, payroll, taxes, budget management, benefits, health insurance and other financial matters. While still a student at the CUNY School of Professional Studies in 2015, Yolanda was hired by her alma mater to work as a Peer Mentor to fellow incoming students during Orientation. Rehired for every subsequent semester to perform this same role as a College Assistant, Yolanda was also promoted to the role of Orientation Night & Weekend Coordinator. 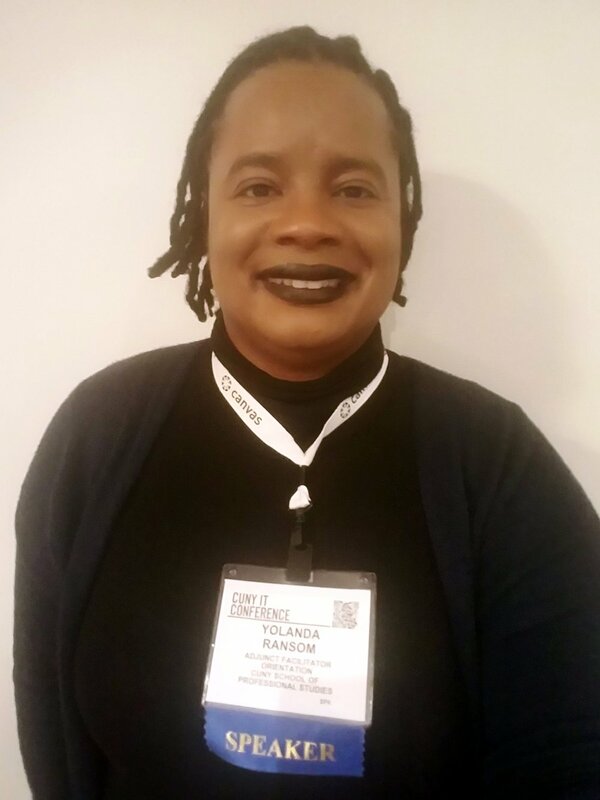 Since 2016, she has been the sole Facilitator of the OLE Orientation course where she coaches and supports new students across CUNY’s 24 campuses in how to be successful online college learners. Since 2014, she has conducted, created and/or presented financial literacy and leadership workshops to high school students, college students and adults at schools, colleges, and non-profit organizations. As a certified Financial Counselor at New York City’s Office of Financial Empowerment, she performed over 100 individual financial counseling sessions with clients. She has taught countless clients how to effectively utilize the financial resources that build long lasting wealth, resulting in clients achieving improved credit scores, increased savings, and newfound financial stability for themselves and their loved ones. Yolanda’s financial blogs have been featured in media outlets such as the Buckeye Review and Black Dollars.Org. Yolanda holds a Bachelor’s Degree in Sociology (with a minor in Developmental Psychology) from the CUNY School of Professional Studies. She is a certified Financial Counselor with a Consumer and Personal Finance Counseling Certification from NYC's Department of Consumer Affairs. Since 2010, Yolanda has been a member of the National Society of Leadership and Success. When she is not speaking, teaching or writing, Yolanda watches comedies, dramas and action movies, and spends time with her husband and family. A music lover since childhood, she spends every other free moment listening to R&B and Hip Hop or creating and recording music as a Soul singer. She lives in New Jersey with her loving husband. Yolanda Ransom is a Financial Educator, Speaker and Trainer who teaches individuals how to confidently master their money so they can achieve all of their financial dreams. After struggling with thousands of dollars in credit card debt many years ago, it hit Yolanda just how little she knew about managing money. She resolved to change this and successfully paid off her credit card debt and began saving money. Dedicated to helping others like her achieve financial freedom, Yolanda started her business, Yolanda Ransom Consulting. Her goal is to empower others to OWN their finances and her motto is “If we don’t take control of our own financial futures, no one else will do it for us. And we CAN.” She has more than 20 years of experience in the financial services industry and holds a Bachelor’s degree in Sociology from the CUNY School of Professional Studies. She is a certified Financial Coach and has advised thousands of clients regarding various financial matters at companies like Xerox, H&R Block and Chase Mellon Shareholder Services. Yolanda has conducted numerous Personal Finance and Leadership workshops with high school students and adults. Each semester since 2015, she has worked as a College Assistant and/or Orientation Facilitator at CUNY’s School of Professional Studies during orientation. When she is not speaking, teaching or writing, Yolanda is watching comedies, dramas, or action movies or spending time with her husband and family. A music lover since childhood, she spends every other free moment listening to R&B and Hip Hop music or creating and recording music as a Soul singer. She lives in New Jersey with her loving husband. Interested in hiring Yolanda to speak at your next event? Please email her at yolanda@yolandaransom.com or call (201) 754-4460.